The word “gull” probably has the ability to elicit the widest range of emotion among birders and non-birders alike of any bird name. To some birders, “gull” means woe and misery, but to others, it means joy and excitement. To the average non-birder, gulls, or “seagulls,” are a nuisance, “flying rats” that steal food at picnics and eat garbage at the dump. It's also probably one of the few groups that has some of the most sought-after rarities, along with some of the most common “trash” birds. But, what is a gull? Gulls are part of the order Charadriiformes. Within this large, diverse order, the gulls (part of the family Laridae) are part of the suborder Lari. The Laridae is sister to the skuas/jaegers (Stercorariidae) and the auks (Alcidae). These families are in turn sister to the Crab Plover (Dromadidae) and coursers/pratincoles (Glareolidae). In the Lari, the button quail (Turnicidae) are sister to the rest of the group (Baker et al. 2007, Pereira and Baker 2010). Within the family Laridae, the gulls are related to the terns and skimmers. While the exact relationships of the gulls relative to the terns and skimmers has not been completely resolved, a recent in depth phylogeny shows the gulls as sister to skimmers, which are in turn sister to most of the terns (Baker et al. 2007). In this study, the noddies (Anous) and white terns (Gygis) fall outside of the “tern” clade, and are sister to the entire group of gulls, terns and skimmers. Other recent studies have found conflicting results to Baker et al. (2007), instead finding the terns as sister to the skimmers, which are then in turn sister to the gulls (Fain et al. 2007), or with the gulls and terns as sister, which are then in turn sister to the skimmers (Ericson et al. 2003). In a phylogenetic study of the terns, Bridge et al. (2005) found the terns to compose a monophyletic group. However, this may not reflect the true phylogeny, as the outgroup (Ring-billed Gull) may have been forced, forcing a monophyletic Sterninae (more on tern phylogeny in another post). Within the Laridae, the species level relationships have not been well-resolved. However, the phylogeny been found to consist of several well-supported clades, which renders the traditional Larus (sensu lato) paraphyletic with respect to several of the long-held “unique” genera. This has left two main options, 1) place all gulls in the genus Larus, losing the long recognized unique genera of Rissa, Pagophila, Xema, and Rhodostethia, or 2) break up the traditional Larus. Based largely on the phylogeny of Pons et al. (2005), the AOU and other organizations chose the later, and split up the large and bulky genus Larus into several smaller, distinct genera. While sampling is not extensive, Baker et al. (2007) recovered different results from Pons et al. (2005) with respect to basal relationships. Baker et al. (2007) found that the Swallow-tailed Gull was sister to Ross’s Gull, which were in turn sister to a clade that includes Sabine’s Gull, Ivory Gull, the kittiwakes, and Larus. I’ll briefly go through the main highlights (using the “new” genera) of Pons et al. (2005), moving from most basal to most derived. Figure 1 from Pons et al (2005) showing the phylogeny of the gulls based on mitochondrial DNA sequence data. Note the old names are used in the figure. Click on the figure to make it larger. Creagrus – 1 species, Swallow-tailed Gull (C. furcatus), endemic to the Galapagos. A truly unique gull, and partly nocturnal, it spends much of its time far from land. The Swallow-tailed Gull has been found to be sister to the rest of the gulls. Xema – 1 species, Sabine’s Gull (X. sabini), a gull breeding in the arctic and sub-arctic, and spending the non-breeding period far from shore. A striking gull, it’s forked tail and bold wing pattern make it stunning bird in all plumages. The Sabine's Gull is sister to the Ivory Gull. Pagophila – 1 species, Ivory Gull (P. eburnea), a gull that spends nearly its entire life in the arctic and along the edges of the pack ice of the far north, this beautiful species is a much sought after species of southern latitudes, and may be suffering due to changes to its Arctic habitat due to global climate change. The Ivory Gull is sister to the Sabine's Gull, which are in turn sister to the kittiwakes. Chroicocephalus – 11 species. 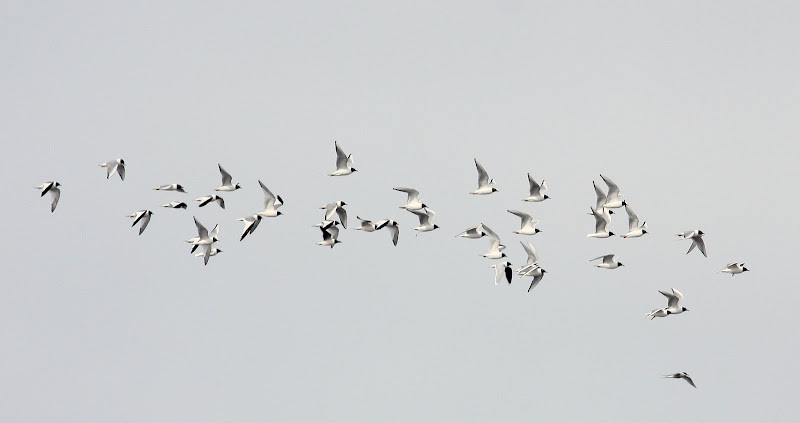 This is a well-supported clade of relatively small, mostly hooded gulls. The North American boreal breeder, Bonaparte’s Gull (C. philadelphia) is sister to Slender-billed Gull (C. genei). These two species are sister to the rest of the genus. The remaining Chroicocephalus form a weakly-supported clade, to which Andean Gull (C. serranus) is basal. The Brown-hooded Gull (C. maculipennis) is sister to the remaining members of the clade. Within this clade, Hartlaub’s Gull (C. hartlaubii) is sister to Grey-hooded Gull (C. cirrocephalus). These two species are sister to Black-headed Gull (C. ridibundus) and (C. brunnicephalus). These four species are in turn sister to a group of three Australasian gulls, with Black-billed Gull (C. bulleri) being most closely related to the Red-billed Gull (C. scopulinus) and Silver Gull (C. novaehollandiae). Saundersilarus – 1 species, the Saunder’s Gull (S. saundersi), is found only in East Asia, where it is threatened with habitat destruction. This species is not closely related to any other gull, and its relative position in the phylogeny is not well-resolved, possibly due to its long branch on the tree. Rhodostethia – 1 species, the Ross’s Gull (R. rosea), is a breeder in Arctic Russia, Canada, and Greenland, is a sought after bird when it ventures to southern latitudes. This species put Churchill, Manitoba on the map in terms of birding, as the most accessible location in the world to see this bird on its breeding grounds. While no longer reliable (seen in June 2008 once, and not at all in 2009 or 2010 while I was in Churchill), many people still travel there every June hoping to see this beautiful gull. Pons et al. (2005) proposed to lump Rhodostethia into Hydrocoloeus based on strong genetic and morphological support. While it has been accepted that Ross’s and Little Gulls are sister species, the AOU chose to retain Ross’s Gull in its own monophyletic genus. The Ross's Gull is sister to the Little Gull. However, the relative position of these two species with respect to the rest of the phylogeny of gulls is not well-supported. 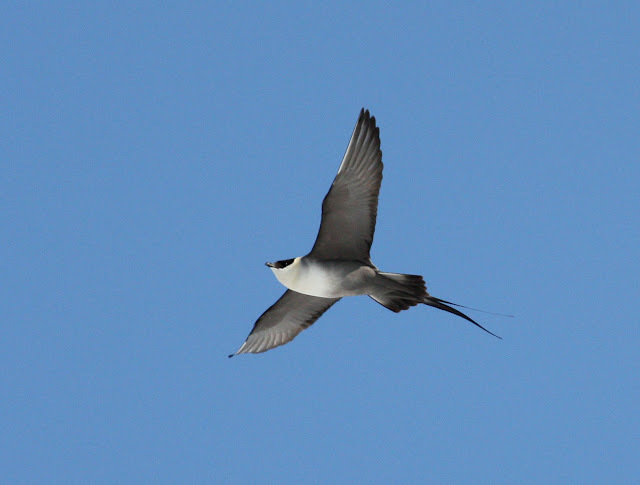 Hydrocoloeus – 1 species, the Little Gull (H. minutus), is fairly widespread in Eurasia, and breeds in small pockets in North America. This bird is sister to Ross’s Gull (Rhodostethia rosea), and shares a suite of morphological and behavioral characters. Leucophaeus – 5 species; an entirely New World group of gulls. This clade appears to be sister to the remaining two genera of gulls, the Ichthyaetus and Larus. Within the genus, the Grey Gull (L. modestus) is sister to the bizarre and intriguing Dolphin Gull (L. scoresbii). These two South American species are sister to the remaining three species, with Franklin’s Gull (L. pipixcan) being most closely related to the Lava Gull (L. fuliginosus) of the Galapagos, which are in turn sister to the Laughing Gull (L. atricilla). Ichthyaetus – 6 species; an entirely Old World radiation of gulls. This clade is sister to the large and confusingly specious Larus. None of the relationships within this group are well resolved. The topography within Pons et al. (2005) places the Mediterranean Gull (I. melanocephalus) as sister to the rest of the genus, which includes Audouin’s Gull (I. audouinii), Relict Gull (I. relictus), White-eyed Gull (I. leucophthalmus), Great Black-headed Gull (I. ichthyaetus), and Sooty Gull (I. hemprichii). Larus - the rest... the dreaded “large, white-headed” gulls (LWHG) of the genus Larus. Within the genus Larus, the “black-tailed” gulls, which includes Belcher’s Gull (L. belcheri) and Black-tailed Gull (L. crassirostris), form a distinct clade that is sister to the remaining LWHG. The rest of the juicy details about this messy genus will be coming in later posts. You got a tern in one of those Bonaparte's/Sabine's/Little flocks!